Ted says that the photo was taken by C. A. J. Nevitt, a Crewe apprentice and is mentioned in Brian Reed's book on Crewe Works. The engines are obviously a 'Prince' and a 'Claughton' (nos. 5636 and 5905). But what, where, when, and especially what is the second carriage? Cannot help with the location, but think the carriage could be an ex Midland Railway pullman. These were downgraded at an early date and I believe were generally relegated to excursions. The location is Chester, with the mighty Chester No.2 cabin (182 levers, 96ft 6in long, elevation 22 ft) visible. The train is signalled into No.6 bay platform. The signals with distant arms beneath read to the Down Main (through line) and Down Platform Line 5. The first vehicle is an ex-LNWR 42ft 0in Brake Van of D.383, of which 40 were built and 39 reached the LMS. The second is exceedingly rare: it is an ex-Midland Railway 60ft 0in Pullman First Class Sleeping Car of D.453, the bodies of these were built in the USA in 1900. There were four of these, and three were still in existence in 1925 when they were replaced in capital stock and transferred to the duplicate list. The date of withdrawal is unknown, but they had gone by 1933, which will help to date the photograph to c.1930-1. The third carriage is also ex-Midland, probably a dining/kitchen saloon, possibly D.448. The remaining carriages are too indistinct, but all appear to be (elderly) arc-roof stock. The last vehicle appears to be ex-LNWR (D.316?) and has a guard's ogee. It is hard to see these old vehicles being assembled into a special revenue-earning train. Apart from the D.383 van it might be more likely that these were all on their last journey to Wolverton for breaking up - but they are heading the wrong way! Nor would such a light train justify two engines. At this distance in time the nature of the train can only be conjectured. John Alsop's suggestion of an excursion (Chester Races?) would be very plausible were it not for the First Class Sleeping Car. I have never heard of an excursion including one of these! And excursions very rarely included Dining Cars. Yet the rolling stock is too elderly to suggest a VIP special. The light-weight train is well within the capabilities of the Prince of Wales, let alone the Claughton. Three things need to be added in this discussion. Firstly, the Prince carries express headlamps, and the Claughton still seems to have its lamps in position (the right-hand lamp at least can still be seen). Secondly, there is a reporting number on the front of the Claughton. The board has slipped sideways, so part of the number � 10? � is obscured. This implies that the Prince has been added at some point on the journey, and the board has not been transferred. So either the Claughton is ailing in some way or the Prince has been put on the front simply to get it to Chester. No list of LMS reporting numbers seems to have survived. At least I have failed to find one, and the LMS Society does not know of one. Thirdly, Malcolm Lewis has kindly provided details about the Claughton which enables the photograph to be dated fairly precisely. Early in 1928 no. 5905 had 10in cabside numerals, which were replaced by 14in numerals later that year. In April 1930 it was converted to suit the Northern Division loading gauge - chimney, safety valves and dome replaced, cab roof modified etc. The modifications are quite noticeable and must have occurred after this photo was taken. So the date of the photo must be mid-1928 to March 1930. As regards the signals, I have consulted Richard Foster, who has been extremely helpful. He confirms that the train is entering Bay 3, now Platform 6 and 406 feet long, and he guesses that the train length is about 470 feet. But any problem resulting from the train being longer than the platform would have been resolved, as soon as platform work had been completed, by a station pilot removing it to a siding. Richard also points out that a headboard displaying a reporting number does not necessarily signify an excursion, as on certain days when traffic was exceptionally busy, reporting numbers were carried by all trains through Chester, certainly in later LMS and early BR days. In this case, however, the unusual carriages suggest that the train is a special of some kind. Richard goes on: "With the unusual stock it is pretty certain that the train is a special. With the Midland vehicles, I wonder if it is something from the East Midlands/Leeds/Carlisle come overnight for an early start, hence the sleeper for the richer passengers?" Perhaps the train conveys the Newmarket Racehorse Owners Club, on their way to Chester races, or the Bradford Association of Wool Merchants on their annual outing to the same place, or possibly the American Association of Classical Scholars going to view the Roman remains in Chester on their tour of Great Britain. Special trains such as this were rare, compared with third-class excursions, such as from the mill towns of Lancashire to Blackpool, but they existed. There is a photo of the Claughton G.R.Jebb in the platform at Chester in the early 1920s with a special train conveying directors of the Shropshire Union Railway and Canal Company, of which Jebb was the chairman, to the company AGM at Chester. Such specials were only rarer because there were fewer people who could afford them. Finally, Richard adds: This actually raises an interesting question. When signalmen accepted trains that needed to go into short platforms or bays, how did they know that they would fit? In theory the timetable office, when they prepared the schedule for the special would take into account all the route and rolling stock restrictions in scheduling the train and would specify the maximum (or precise) load and the motive power to be used. However, I am not sure how accurately the timetable office would know the lengths of platforms and loop lines etc. I have never seen an LNW document that detailed such things. In addition, other documentation suggests that the formation of trains on the day could be adjusted to suit the number of passengers turning up. Scheduled trains could also be varied on a day-to-day basis to suit traffic (e.g. the addition of horse boxes), while vehicles and engines could be added en-route. Again, in theory, such information was supposed to be telegraphed forward, but one wonders how reliable the system was. Possibly at place like Chester there were official or unofficial arrangements in place whereby the signalmen at signal boxes on the approach to the station would count the numbers of vehicles on trains and pass the information forward. In busy areas it was common for additional train running and routeing information to be circuited or telegraphed forward to help the signalmen. For freight trains the system seems to have been a bit hit and miss � signalmen sometimes had to stop freight trains to find out how long they were before deciding how to route them. In this connection, the main reason the train in the picture is too long for the bay is because of the presence of the second engine. I agree that the most probable explanation for the two engines is that the Claughton has failed in some way (but with an ailment which would not disable it from running such as a hot axlebox) and the POW is assisting. But why was the Claughton not simply removed from the train and replaced by the POW at Crewe, Warrington or wherever? Or was it a Chester engine that was allowed to limp home? Could someone give an example of an engine failure that would allow the loco to continue but only if assisted by another engine? Brick arch collapse, possibly? As I say, all the rolling stock is elderly, and it is hard to see this being assembled as a VIP special. Somehow I do not see the Bradford Association of Wool Merchants being content with riding in this stock. And I have never heard of a sleeping car (even an old one) in an excursion. I feel that it is significant that there are no Family or Picnic Saloons in the train, suggesting individual bookings rather than private parties. As the stock is LMS the train must have originated on the LMS (not Newmarket). One tenuous clue is that Midland Carriages by Essery and Jenkinson. Plate 71 shows a Sleeping Car No.02773 (the last of the series) with an ex-LNWR Family Saloon (still in LNWR livery) at an unknown location but with a Yorkshire air to it. The toplights above the double windows on the sleeper are two separate units, and not the double-width type which were provided on the first three saloons (although it is unknown whether this was a modification carried out on all of them). Now Mystery Photo no. 93 is not too distinct, but as far as I can see the toplights appear to be separate units. So we can conjecture that the carriage is perhaps no. 02773, and the origin of the train is perhaps West Yorkshire. One of the carriages at the rear of the train has an L&YR look to it. But again, the $64,000 question is - why was a (very elderly) supplementary first class sleeping car included? Another scenario is that the two leading carriages are not part of the excursion train, but are being worked empty to Chester (and possibly beyond) in preparation for some other duty. The only trains at Chester with sleeping cars are the night Irish Mails. Perhaps these two old carriages are to be pressed into service on Irish Mail reliefs. On further enlarged inspection the third carriage would seem to be an ex-Midland Railway 60ft 0in sleeping saloon to D.452 rather than the very similar dining saloon of D.448. This supports my suggestion that the two sleeping saloons were being worked empty to Chester (and beyond) for use on relief night Irish Mail services, perhaps while the fleet of ex-LNWR sleeping saloons was depleted by repair work/overhauls etc. or on some occasion involving exceptionally heavy traffic. 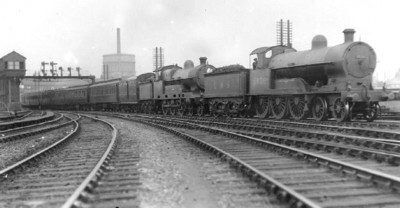 So far we have had two empty sleeping saloons destined for Holyhead entering a bay platform at the front of an excursion train carrying express headlamps, excursion trains conveying empty stock, sleeping saloons for Holyhead entering a bay platform at Chester and empty stock being hauled by engines carrying express headlamps. It has also been suggested that these sleeping saloons, being "elderly", are unsuitable for first-class excursionists, but are suitable for first-class passengers on reliefs to regular services. In the 1950s the Wolves met Sunderland in the cup and five specials were run from Wolverhampton to Sunderland. The stock was perfectly adequate, five Jubilees - some ex-works, others from Bushbury shed, were found to haul the trains to York, where five V2s took them on to Sunderland. One of the five trains, I believe, conveyed the directors in first class. One Saturday in the 1960s, after the Liverpool-Crewe electrification came into operation, five specials ran from Euston for the Grand National at Aintree, hauled between Euston and Crewe by Duchesses. Some of the trains conveyed first-class passengers and had dining cars. Just because stock was "elderly" or even "very elderly", did not mean that it was sub-standard. In fact, it was maintained in good order so as to be perfectly acceptable to passengers whenever it was required. If that could be done in the 1950s and 1960s, it happened far more often in the late 1920s. These saloons, one sleeper and one diner, or whatever, are part of an excursion to Chester, quite possibly for Chester races. That seems a credible scenario. I have never yet found an excursion train conveying first class sleeping cars. Can you offer any confirmed example? Presumably even the Directors of Wolverhampton Football Club did not require sleeping cars on a daytime journey, so I am afraid that I do not see any relevance in these 1950s examples. There were of course excursions regularly operated to Chester Races, but as racing (like football) starts after lunch they would tend to arrive in mid- or late-morning. Even a train from Glasgow or Edinburgh (about 220 miles) would not need to start before 0600. But it is far more likely that the train came from Yorkshire. As I have said, I feel that it is significant that there are no Family or Picnic Saloons in the train, suggesting individual bookings rather than private parties. The reason for two engines has not been commented on. Train is heading on line towards Manchester, Frodsham. Lines on right hand side and in foreground of picture are for Crewe. Other lines behind train lead to Chester shed and some of the sidings. As regards coaches 2 + 3. Could they be from the Mersey Railway stock going to/from repair or for some other unknown reason bearing in mind the close proximity of the Mersey Railway to Chester? I have seen other photos of Mersey Railway stock and they appear very similar. With regard to the suggestion that two of the coaches might be from the Mersey Railway I do not think this could be so. I believe Mersey Railway stock had the Westinghouse braking system. This would surely prevent them being included in a vacuum braked train. It is possible to isolate a braking system but would this be permitted in the what we presume is a passenger train? I am afraid that Robert Graham is completely wrong in every respect. The train is (as already stated) heading into Chester bay Platform 6, and coaches 2 and 3 are ex-Midland Railway as previously described. I wonder if Philip has evidence of empty stock being worked under express headlamps with a reporting number or of empty stock being worked in excursion trains full of excursionists? Excursion trains were planned weeks ahead. Instructions were issued down the chain of command, so that the stock would be prepared and shunters somewhere would make up the trains as required. Race specials catered for all classes of society. The strengthening of services at peak times was the same. If additional sleeping saloons were required at Holyhead, the movement would be planned weeks ahead and they would be moved accordingly, not tacked on to the front of a race special via a bay platform en route. A train like that makes me think troop train. These were frequently made up of elderly stock. First class dining or sleeping cars would cater for the officers with a mixture of other third class excursion vehicles for other ranks. There is a good proportion of brake space for luggage which would be unusual on most excursions, but necessary for the military. I believe there were quite a lot of military movements by rail at that time.